Local Maori knew the Valley for its abundant food and natural resources, which they exploited on expeditions to the area in the warmer months. The Valley was permanently settled by European farmers in the 1850s, and its history since has involved the exploitation of the area's gold and energy resources, as well as its temperate climate which has made it the country's southern-most fruit-growing area. The Teviot District Museum's collection reflects our story. The Clutha River/Mata-au was an important waterway for early Maori – it was a useful landmark to track their visits into Central Otago to collect raw materials like stone and fibres from the flax and cabbage tree or for collecting food like moa, duck and eels. Though there is no evidence of permanent settlement in the Valley by Maori, their presence is known by the remains of camp sites and seasonal settlements which contain stone tools, moa and other bones and other signs of habitation. On their way to the Dunstan gold diggings in early 1862, prospectors Andrew Young and James Woodhouse carried two other travelers across the Teviot River where it meets the Clutha and stopped to dry their clothes. While they waited, they panned a little to pass the time and found traces of significant deposits convincing them to stay. At its height, it is estimated that around 600 prospectors crowded the banks of the Teviot and Clutha Rivers trying to make their fortunes. While the initial gold-rush days were short-lived, gold continued to be a major attraction. Gold dredges worked on the River until well into the 20th century. You can see the wreck of an old dredge at the bottom of Tweed Street in Roxburgh. Remnants of our gold-mining history abound, from the stacks of rocks (tailings) that are scattered across the district to the Pinders Pond, a lake formed by the gold-mining process. You can experience gold-panning as practiced by prospectors in a modern-day claim not far from Woodhouse & young's original claim. Reminders of our Scottish ancestry can be found throughout the Valley. 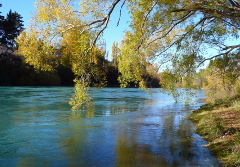 The Clutha River is named after the Clyde – a significant river in Scotland. The town of Roxburgh and the Teviot Valley are named for locations on the Scottish border. 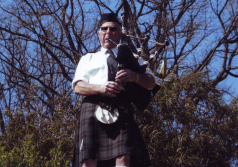 Our Scottish heritage is celebrated regularly throughout the Valley, with street names and localities named for Scottish landmarks. Permanent European occupation of the Valley started in the 1850s when sheep farmers started to utilise the flat and fertile areas alongside the river, but settlement really took off when gold was discovered in the Teviot River. Joseph Tamblyn is said to have planted the first fruit trees in this part of the world in the late 1860s and the fruit-growing industry characterises the Valley today.